Peru is a country almost twice the size of the state of Texas, with a population of 30 million people. Thousands of tourists are drawn to Peru every year to enjoy the country’s magnificent geographic, biologic, and cultural diversity. A primary destination for most travelers is the remarkable Incan ruins of Machu Picchu, named a UNESCO World Heritage site in 1983 and voted one of the New Seven Wonders of the World in 2007. Machu Picchu is located in southern Peru and stands in the middle of a tropical mountain forest, in an extraordinarily picturesque setting. It was probably the most amazing urban creation of the Inca Empire at its height; its giant walls, terraces, and ramps seem as if they have been cut naturally in the continuous rock escarpments. The natural setting, on the eastern slopes of the Andes, is in the upper Amazon Basin, with its rich diversity of flora and fauna. A visit to Peru will likely begin in the capital city of Lima, a sprawling megacity that is home to approximately one-third of Peru’s population. Interestingly, many people think Lima is a high-altitude Incan city, but it is actually located on the Pacific coast at sea level (Map 4-10). From Lima, one can take an hour-long flight to Cusco, the gateway to Machu Picchu and a worthwhile destination of its own. Tourists can visit multiple Inca-era ruins, both in Cusco and mountain villages and markets in the Valle Sagrado (Sacred Valley), before taking the train to Machu Picchu. From the train there are multiple ways to reach the actual site, varying from buses up the mountain to Machu Picchu from the nearby town of Aguas Calientes to multiple-day hikes across Andean mountain trails. One of the world’s most popular and best-known treks, the Inca Trail, begins at an elevation of more than 8,000 ft (>2,500 meters) on the Cusco–Machu Picchu railway. This moderate 26-mile (43-km) trek is usually done in 4 days and 3 nights, and most fit people should be able to complete the hike. Nevertheless, it is quite challenging, with 3 high mountain passes; the highest is Warmiwañusca at 13,796 ft (4,205 m), before ending at the ruins of Machu Picchu (7,970 ft; 2,430 m). Many people also wish to add a tropical rainforest experience to their Cusco trip and take the 30-minute flight from Cusco to Puerto Maldonado, 34 miles (55 km) west of the Bolivian border, at the confluence of the Rio Tambopata with the Madre de Dios River, a major tributary of the Amazon River. Most travelers take a boat up the Rio Tambopata to one of several rustic lodges. Visitors wanting to see the Amazon rainforest may also go to the more remote Manu National Park in the south, also reached via Cusco. Other popular tourist destinations in Peru include the northern Amazon rainforest in Loreto, which can be visited by traveling to the lodges around Iquitos or by journeying on the increasingly popular Amazon River cruises that go both upstream and downstream from Iquitos. Also, Peru is home to the Cordillera Blanca, a hundred-mile range of spectacular snow-covered peaks that form the backbone of the Andes Mountains in Peru. The Cordillera Blanca boasts 33 peaks >18,040 ft (5,500 m) and has an international reputation for its spectacular trekking and world-class mountaineering. Puno and Lake Titicaca, which has been called the highest navigable lake in the world, in southern Peru near the Bolivian border are also popular with tourists, with itineraries that include visitations to islands on the lake. Another tourist destination south of Lima is the Nazca Desert, home of the ancient geoglyphs known as the Nazca Lines. 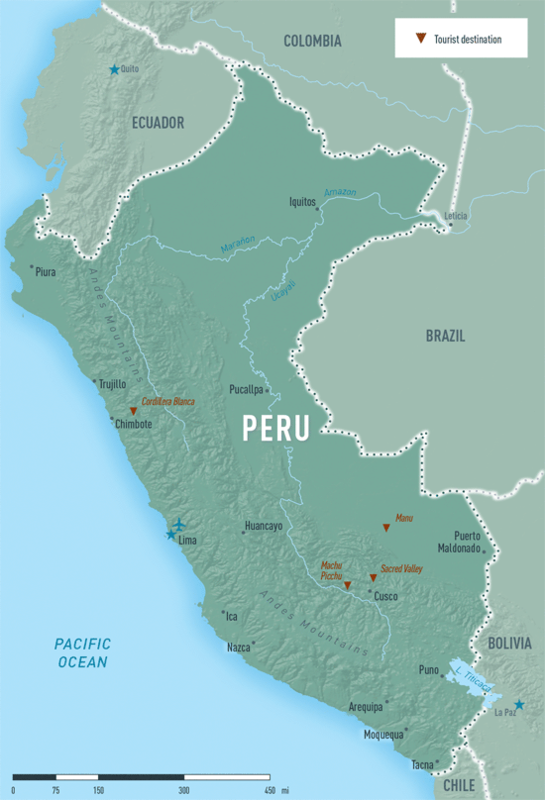 Important pretravel information for Peru includes advice on preventing high-altitude illness, the risk for cutaneous leishmaniasis in certain jungle areas, the risk of vectorborne illnesses, including malaria, and the use of yellow fever vaccine in some areas. Surveys have shown that most travelers arrive in Cusco with limited or no knowledge of AMS or the fact that AMS can be prevented to a large degree by prophylactic use of acetazolamide. Every traveler to Cusco should be counseled about AMS before travel and be prepared to prevent or self-treat AMS with acetazolamide. Travelers to other parts of Peru may also require counseling about AMS; other common travel destinations at high elevation include the Cordillera Blanca (peaks >18,040 ft; 5,500 m), Puno (12,556 ft; 3,830 m) and Lake Titicaca. (More information about prevention and treatment of altitude illness can be found in Chapter 2, Altitude Illness.) Locals refer to AMS as soroche and will almost always offer the new arrival a cup of hot coca tea (mate de coca) when checking in to the hotel. Although many believe mate de coca can prevent and treat soroche, no data support its use in the prevention or treatment of AMS. Perhaps of concern to some who may experience random drug screening as a condition of employment, people who drink a single cup of coca tea will test positive for cocaine metabolites in standard drug toxicology screens for several days. However, sitting quietly and resting while enjoying a cup of tea is a most civilized activity and a pleasant memory. New arrivals may also find it helpful to transit directly from Cusco to the Valle Sagrado of the Rio Urubamba (Sacred Valley) to spend the first few days and nights at a somewhat lower altitude. This spectacular river valley begins 15 miles (24 km) northeast of Cusco in the town of Pisac (9,751 ft; 2,972 m), known for its colorful Sunday markets, and continues downstream toward the northwest for another 37 miles (60 km) to reach the town of Ollantaytambo (9,160 ft; 2,792 m). One can board the train to Machu Picchu in Ollantaytambo, at the northwest end of the Valle Sagrado and then visit Cusco on the return from Machu Picchu, when people are better acclimatized. The train follows the Rio Urubamba north and northwest (downstream) to Aguas Calientes (6,693 ft; 2,040 m). Machu Picchu (7,972 ft; 2,430 m) is located on a ridge above the town. Many areas in the Pacific valleys of the Andes and the Amazon tropical rainforest are endemic for cutaneous leishmaniasis (CL), a parasitic infection transmitted by bites of sand flies (see Chapter 3, Leishmaniasis, Cutaneous). While this disease is widespread in southeastern Peru, the highest risk for travelers seems to be in the Manu Park area in Madre de Dios. In Manu, CL is most often caused by Leishmania braziliensis, and there is a risk of both localized ulcerative CL and mucosal leishmaniasis. There is no visceral leishmaniasis in Peru. Travelers should be counseled to be meticulous about vector precautions, as there is no vaccine or prophylaxis to prevent leishmaniasis. Any person with a skin lesion persisting more than a few weeks after return from Peru should be evaluated for CL. Proof of yellow fever vaccination is not required for entry into Peru. Travelers who are limiting their itineraries to Lima, Cusco, Machu Picchu, and the Inca Trail do not need yellow fever vaccination. Peru recommends vaccination for all travelers >9 months of age who intend to visit any jungle areas of the country <7,546 ft (2,300 m). For complete CDC yellow fever vaccination recommendations for Peru, see Chapter 3, Yellow Fever & Malaria Information, by Country. Both Plasmodium vivax malaria and P. falciparum malaria are found in the Peruvian Amazon, as well as the central jungle and northern coastal regions. Among people with severe malaria hospitalized at a tertiary referral center in Lima, most were P. vivax infections, and almost half were infected in Amazonia. There is no malaria risk for travelers visiting only Lima and its vicinity, coastal areas south of Lima, or the popular highland tourist areas (Cusco, Machu Picchu, and Lake Titicaca). The malaria-endemic areas for most tourists are the neotropical rainforests of the Amazon (see Map 3-37). Malaria in the Peruvian Amazon is unpredictable from season to season; P. falciparum epidemics occasionally occur in the Loreto region. The city of Iquitos in the northern rainforest is a frequent arrival destination for those traveling to jungle lodges around the city or for boarding river cruise boats for rainforest travel. Malaria transmission occurs in the areas in and around Iquitos. Malaria transmission occurs throughout the year but is seasonally variable, with peak activity between January and May that correlates with the rainy season. Prophylaxis is recommended for most travelers. The city of Puerto Maldonado is a 30-minute flight from Cusco and a popular arrival destination for those visiting the rainforest lodges on the Rio Tambopata. Newly arrived travelers usually transit directly from the airport to the boats that take them up the river to numerous lodges. Peruvian Ministry of Health data document that malaria transmission occurs in Puerto Maldonado. Most cases reported in the region occur in local loggers and gold miners in the forests. Typical travelers’ diarrhea is relatively common. Fluoroquinolone-resistant Campylobacter gastrointestinal infections can occur and should be suspected in anyone with a gastrointestinal illness with fever and systemic symptoms and failure to clinically improve in 12–24 hours after initial empiric fluoroquinolone treatment. Azithromycin can be used for people who do not respond to empiric treatment of acute gastroenteritis with a fluoroquinolone. Cyclosporiasis, an intestinal illness caused by the parasite Cyclospora cayetanensis, is also common in Peru. This diagnosis should be considered in people with watery diarrhea, loss of appetite, weight loss, cramping, and bloating that persist for days to weeks. Treatment is with trimethoprim-sulfamethoxazole. Dengue is common in the neotropical areas of Peru and the northern coast. Mayaro virus, an alphavirus found in the Amazon Basin and transmitted by mosquitoes, causes a dengue-like illness. As with other alphaviruses, Mayaro can result in lengthy and debilitating arthralgia. Chikungunya, another alphavirus that can cause arthralgia, has also been reported in Peru. The first cases of local vectorborne Zika virus transmission were reported in Peru in 2016. Because of the risks to pregnancy, travelers should consult the CDC Travelers’ Health website (www.cdc.gov/travel) for the most current recommendations for Zika. Travelers to Peru should take measures to protect themselves from daytime mosquito bites to prevent vectorborne illnesses (see Chapter 2, Protection against Mosquitoes, Ticks, & Other Arthropods). Physicians treating patients with signs and symptoms of a denguelike illness and a recent history of travel to the Amazon should consider Mayaro, chikungunya, and Zika in the differential diagnosis. Cabada MM, Maldonado F, Quispe W, Serrano E, Mozo K, Gonzales E, et al. Pretravel health advice among international travelers visiting Cuzco, Peru. J Travel Med. 2005 Mar-Apr;12(2):61–5. Llanos-Chea F, Martínez D, Rosas A, Samalvides F, Vinetz JM, Llanos-Cuentas A. Characteristics of travel-related severe Plasmodium vivax and Plasmodium falciparum malaria in individuals hospitalized at a tertiary referral center in Lima, Peru. Am J Trop Med Hyg. 2015 Dec;93(6):1249–53. Mazor SS, Mycyk MB, Wills BK, Brace LD, Gussow L, Erickson T. Coca tea consumption causes positive urine cocaine assay. Eur J Emerg Med. 2006 Dec;13(6):340–1. Neumayr A, Gabriel M, Fritz J, Gunther S, Hatz C, Schmidt-Chanasit J, et al. Mayaro virus infection in traveler returning from Amazon Basin, northern Peru. Emerg Infect Dis. 2012 Apr;18(4):695–6. Salazar H, Swanson J, Mozo K, White ACJ, Cabada MM. Acute mountain sickness impact among travelers to Cusco, Peru. J Travel Med 2012 Jul;19(4):220–5. Shaw MT, Harding E, Leggat PA. Illness and injury to students on a school excursion to Peru. J Travel Med. 2014 May-Jun;21(3):183–8. Steinhardt LC, Magill AJ, Arguin PM. Review: Malaria chemoprophylaxis for travelers to Latin America. Am J Trop Med Hyg. 2011 Dec;85(6):1015–24.